We’d love your help. Let us know what’s wrong with this preview of Prairie Evers by Ellen Airgood. To ask other readers questions about Prairie Evers, please sign up. What was the first thing Prairie and Ivy did together on the playground? I thought, You are my earth. How will I grow up any more without you? "Crying don't get the oil changed"
...that was the silver lining in the cloud. Grammy always told me to look for the good even in bad situations. It's a challenge, but pretty often you can find something if you look hard. In a pack of coyotes, everyone watches out for one another: they are a team. It works that way with coyotes and cats and chickens, and I think it ought to work that way with people too. This is a sweet story about a young girl whose family moves from North Carolina to New York state. She has been home-schooled for her whole life so far and when her parents decide she should go to school, she is scared. She doesn't want to go. She dreads the bus, the other students, sitting in school all day... But, she finds something at school that she never had before... a best friend. Young girls will love this sweet story about friendship, dealing with change, and discovering who you are. Cute book about friendship and learning empathy and how to care about other's feelings. I didn't want to read this. I mean, chickens? Really? No, thanks. But I decided to give it a few pages, and before I knew it, I was a good 50 pages into the story. Prairie sucked me right in. Turns out, chickens aren't so bad (as long as I just get to eat them and their tasty by-products, not actually be in the same general area as live ones). Prairie Evers' world is changing too quickly. First she is dragged away from her North Carolina home to live in the hills of upstate New York. Fine. She d I didn't want to read this. I mean, chickens? Really? No, thanks. But I decided to give it a few pages, and before I knew it, I was a good 50 pages into the story. Prairie sucked me right in. Turns out, chickens aren't so bad (as long as I just get to eat them and their tasty by-products, not actually be in the same general area as live ones). Prairie Evers' world is changing too quickly. First she is dragged away from her North Carolina home to live in the hills of upstate New York. Fine. She dealt with it. Then her beloved grandmother, Grammy, tells the family she misses North Carolina too much, and is moving back home. This is almost too much for Prairie to bear. Grammy is her very best friend. But she adjusts. Then the final straw: her parents are sending her to public school. For the first time ever in her life, she will not be homeschooled. This is nearly too much for Prairie to bear. After the first few dreadful days, however, she learns school isn't so bad. It's even better if you have a friend, and Prairie (who isn't so fond of kids her own age, to tell the truth) finds one: Ivy. Both girls are thrilled to have found a true friend. But Ivy's home life isn't a happy one, and something needs to be done about it. You have five main characters here: Prairie, Ivy, Grammy, and Prairie's parents. Loved 'em all. I loved her mother's quiet, loving strength and the relationship between Ivy and her dad (seen often in her attempts to get him to give up smoking, and his response to her). I loved Grammy, who reminded me of Miss Eula in Love, Ruby Lavender, and her down-home wisdom. I loved quiet Ivy's shyness but desire to love and be loved. And I loved Prairie and her clever ways, determination, and zest for life. This is an excellent debut novel. I hope to see more for elementary from Ms. Airgood. Also- is Prairie not the coolest name ever?!? Ellen Airgood is a story teller. This book is engaging, realistic, and complex. That is a pretty darn good mix for a middle-grade novel. Her character development is strong. Granny, Prairie, and Ivy were spot on. The issues explored are important and relevant. I recommend it to kids in 3rd or 4th grade through 7th ish. And I recommend it as a family read aloud. There is potentially a lot to talk in this story. Enjoy!!! This review has been hidden because it contains spoilers. To view it, click here. When Prairie’s parents move them to New York (from North Carolina) to take over Prairie’s grandparents’ farmstead, Prairie isn’t thrilled – especially when her Grammy, who lives with them, announces that she’s moving back to NC. And things don’t improve immediately, either. Prairie also has to go to public school for the first time in her life and the kids there tease her about her name (and because she’s new). The only thing Prairie has to look forward to are her chickens (she convinces her fol When Prairie’s parents move them to New York (from North Carolina) to take over Prairie’s grandparents’ farmstead, Prairie isn’t thrilled – especially when her Grammy, who lives with them, announces that she’s moving back to NC. And things don’t improve immediately, either. Prairie also has to go to public school for the first time in her life and the kids there tease her about her name (and because she’s new). The only thing Prairie has to look forward to are her chickens (she convinces her folks to let her raise chickens, so she can sell eggs at the farmers’ market alongside them – they sell artistic birdhouses and quilts as they work on getting the farm up and running). Then, Prairie makes a friend. Ivy is in her class at school and they have a lot of similar interests, and once they become friends they spend all of their time together. Ivy has problems of her own, though. Ivy’s mother isn’t the best of moms to her, and once she remarries, she’s even less available to Ivy. Prairie and her parents hatch a plan that allows Ivy to live with them (at least for the rest of the school year) and the girls are thrilled. Well, mostly. It turns out that they don’t have everything in common and being almost like sisters means that sometimes you fight. This book was really good! It was about Prairie Evers having to go to school when she's been home schooled her whole life. She thought it was going to be the worst but then she met Ivy and they became inseparable. Ivy was going to have to move with her mom and her new husband George. Neither of them really like Ivy. Prairie's mom convinced Ivy's mom to let Ivy stay with them. They had so much fun everyday! Them Prairie's Grammy came back. It was a happy ending! Here it is, my favorite book of 2012! The chicken tie-in (pecking order!) is too cute! Great conversation and characterization. Prairie learns what being a true friend is all about, also something she needs as she tackles public school after being homeschooled for so many yearsP. Good read-aloud for grades 4 and up. I've only read two of the William Allen White nominees for 2015-- but I know I could vote right now. Hands down the best middle-grade book I've read since I was a kid. And the main character raises chickens!!! What more could a reader want?! As a former homeschooler, I was disappointed with how the parents looked down on homeschooling, fearing that their daughter was spending "too much time with old people," and wouldn't be properly socialized. It annoyed me that these were the only reasons that they sent Prairie to "real school." But that's just my opinion. I quite liked how guns and hunting were dealt with in this story. While Prairie only ever handles a BB Gun in the book, there is a bit of gun safety hidden throughout these pages As a former homeschooler, I was disappointed with how the parents looked down on homeschooling, fearing that their daughter was spending "too much time with old people," and wouldn't be properly socialized. It annoyed me that these were the only reasons that they sent Prairie to "real school." But that's just my opinion. I quite liked how guns and hunting were dealt with in this story. While Prairie only ever handles a BB Gun in the book, there is a bit of gun safety hidden throughout these pages. The idea of hunting, target practice and defending yourself with a gun was not looked down upon as is the case with so many books today. Even after Prairie discovers why Ivy doesn't want to use the gun, she states that she doesn't take it out while Ivy is around, not that she never uses it. While there's no language or out-right violence in the book, Prairie's best friend, Ivy, comes from a difficult household where - when Ivy was quite young - she witnessed a killing. There are no graphic details and I felt it was handled quite delicately, but some parents may not wish their children to read a story involving this type of plot. Prairie Evers, by Ellen Airgood, the theme for me on this book, is when life gives you lemons make lemonade. I think the author wanted me to get this idea, because of all the changes Prairie goes through during the book, and how she learns to accept it. I think the book has definitely accomplished this. The genre of this book is realistic fiction. The setting in this book is New Paltz, New York. I think the author didn't really make me feel like I was there necessarily, but they did a good job wi Prairie Evers, by Ellen Airgood, the theme for me on this book, is when life gives you lemons make lemonade. I think the author wanted me to get this idea, because of all the changes Prairie goes through during the book, and how she learns to accept it. I think the book has definitely accomplished this. The genre of this book is realistic fiction. The setting in this book is New Paltz, New York. I think the author didn't really make me feel like I was there necessarily, but they did a good job with everything else, so it wasn't really necessary for the author to. I think the main characters are definitely believable for this book, mostly because of all the details the author puts, makes them easy to picture. I think a big strength of this book how Ellen really gives her audience a good idea of how she feels. An example, is in the first few chapters when Evers is pretty bummed about something. I really like the author's writing style because it helps me get a good idea of what is going on, but it also keeps me interested. I think this was a great book. Prairie preservers through many comments, she is not taught properly and that she is very unfortunate although she is not. Very sweet story touching at moments. Prairie shows that hard work will pay off. For me this book good because I was able to relate emotionally and physically for example me and her raised chickens. Prairie is a free spirited, fun loving, lover of all things learning, curious spirit. It is easy to feel exactly as Prairie feels throughout the WHOLE book. AMAZING!! Must read. This is a book that will get you to think about family, friends, and overcoming obstacles. While the backdrop is a farm, with chickens!, the story could have taken place in just about any town and at just about any point in time. Prairie is a character that you can root for to rise above the others and make something out of a presumed bad situation. I read 11 chapters hoping it would get better or more interesting. Just didn't. The synopsis on the book cover actually sounded interesting. However, it was just going nowhere with the plot, characters. There was too much whining about grandma leaving. Not good for ES. NO! 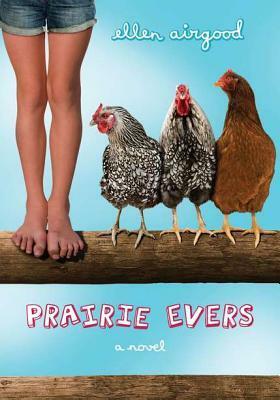 Loved Prairie Evers...the main character telling the story. She is caring, kind, and determined, the kind of friend everyone should have. I loved her grammy too. Thanks for recommending this book to me Harmony! I liked this story a lot. Prairie and her family members and Ivy are all such good, convincing characters. I especially liked Grandma! The story was sweet, and had a bit of depth to it, but was filled the optimism that I love in children's books. This was a very good book. I like all the characters and there personalities. The names are very creative like prairie and ivy, and it has a good problem to solve. I would definitely recommend this book. This book is classified as young adult but is probably at a level for 6-8 year olds. I started reading it anyway and finished in one sitting. It had a good story. I will read it again to my 6 and 8 year old granddaughters. I liked this book, but it was pretty sad. 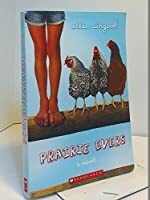 It is about a girl names Prairie Everes and she is starting a chicken farm and she didn't know it was also a rooster farm. This is a tale of a young girl that has to move and is faced with some difficulties of having her grandmother leave, to having to go to school and not being homeschooled anymore. I grew up on a small farm, the youngest of four children. My father was a blacksmith and a schoolteacher. For the last nineteen years I’ve been a waitress in Grand Marais, Michigan. I was twenty-five when I came to this tiny, Lake Superior town, on a camping trip with my sister, and fell in love with the man who made my cheese sandwich and chocolate malt at the local diner. We met, exchanged asses I grew up on a small farm, the youngest of four children. My father was a blacksmith and a schoolteacher. For the last nineteen years I’ve been a waitress in Grand Marais, Michigan. I was twenty-five when I came to this tiny, Lake Superior town, on a camping trip with my sister, and fell in love with the man who made my cheese sandwich and chocolate malt at the local diner. We met, exchanged assessing, almost challenging gazes, and six months later we got married. I told my sister we would, on the way back to our campsite that first day. “You’re crazy,” she said worriedly. But pretty soon she grinned, shook her head, started getting into the spirit of it. “Well,” she said. “This is going to be interesting.” And it has been.